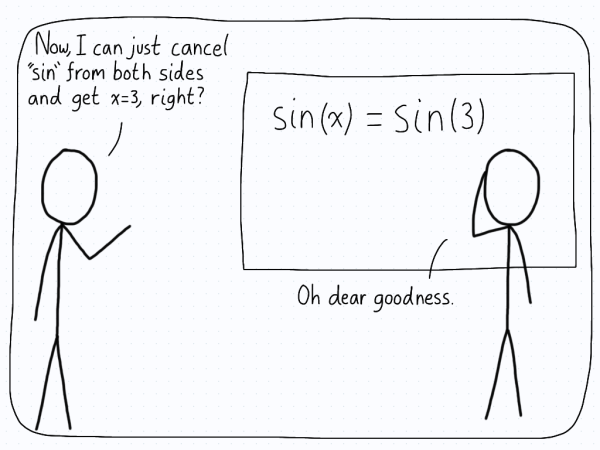 x(t) = x0 + v0t + at2/2. This equation lets us find the position at any time t, since the other parameters are known. You might even recognize this as the equation of a parabola. Students learn about this equation and the others during their first course in physics. They are then encouraged to write down all the equations, and decide on which one to choose based on the parameter that is missing. In the above case, the speed of the object at time t isn’t present. The student agreed that it did seem strange. At the very least, it wasn’t obvious as to why this combination of terms produced the right answer. After all, if you just look at the equation, there’s not much telling you if this is the “right” combination1. So what’s going on here? Of course, the answer is that the equations do come from somewhere. They come from analyzing Newton’s equation F=ma under the presence of a constant acceleration. But if that’s it, why don’t students learn about this first? After all, they encounter Newton’s equation early on. The issue is that one needs to use calculus in order to give a satisfactory derivation of the kinematics equations. In secondary school, students don’t have this background of calculus yet, so they cannot follow the steps (even though they are quite simple). As a result, students are presented only with the final answer. The derivation is left out. The implicit message is that the derivation isn’t that important. The main consequence of this is that students end up seeing these equations as “magic”. In other words, they feel that there’s no way they would have been able to come up with these equations on their own. This is untrue, but the lack of derivation forces them to accept the equations on authority. I hope you can agree with me that this is not a good situation to be in. Accepting equations on authority is in the opposite spirit of both subjects. This encourages students to memorize equations without understanding where they come from and why they are true. After all, if you know where an equation comes from, you don’t have to worry as much about memorizing it. If you forget it, you can always work it out again. We are doing a disservice to students by forgetting about working out the details. We are teaching them that it’s more important to know how to use an equation than where it comes from. We are sending the message that equations and formulas are something to be recalled, but the proofs themselves don’t matter. Yes, it will take more time to present the material. That means there won’t be as much time to do practice problems, and the pace might be slower. But students want to learn about the explanations behind the equations! I’ve found that students are interested in finding the connection between the formulas they have and the concepts they learn. It’s much more satisfying to be able to connect these in one’s mind, and students agree with me. Therefore, we need to move beyond only presenting formulas. This will require a lot of work to create proofs of equations that students learn. It will also require creativity in the presentation, which is where the expertise of the teacher will come in. I’m not suggesting that everything needs to be proved. Even in university, some proofs are skipped due to time constraints. But don’t let results stand on their own. If you don’t have time to prove them, give the students the appropriate resources so that they can look at the connections on their own. Do all you can to make sure that students aren’t forced to accept statements and equations out of the blue. If the students don’t have the requisite background, explain that to them. Don’t just say that “it works”. Give some intuition so that their explanation of a concept doesn’t only involve stating the equation. Our purpose in teaching these concepts should not be about the results. It’s about the links between concepts and the way of thinking that is important. Proofs exemplify these principles, while the formula at the end is just a nice endpoint. The real learning comes through understanding where this equation originates, not the fact that it works. Anyone can learn to substitute numbers into an equation and get an answer. But why does this equation do the thing you want it to do? Is this form particular, or are there different ones that can be used? Does the equation seem surprising? If so, can a student work from first principles to get back to that equation? These are the questions that should be asked more often in the classroom. Behind every equation lurks an explanation. Don’t be fooled into thinking the equation itself is the point. Always shine a spotlight behind an equation to illuminate its origin and the reason it works. One of the differences between physics and mathematics is that mathematicians don’t tend to care about the units they are working with. In fact, they will usually consider all quantities as unitless1. This makes it easy to compare quantities, because one only has to look at the number itself. If you have two numbers, 5 and 9, you know that 9 is the larger quantity. In physics, however, the situation isn’t quite the same. That’s because our quantities have dimensions attached to them. As such, it doesn’t make sense to say that 5 L is larger than 3 m, since they don’t describe the same property of a system. Therefore, in physics we require more than just a comparison between the value of numbers themselves. We want the dimensions of the quantities to match up as well. Things can get tricky though, because different people use different units to describe the same dimension. For our notion of length, we have plenty of units, from the metre to the yard to the light year. They all represent length, but there’s a huge difference between one metre and one light year. From this, we conclude that in addition to requiring quantities to be in the same dimension in order to compare them, they also need to have the same units. If this seems like it can get messy with all of the different units people use, you are correct. This is why many physicists like to use dimensionless quantities such as ratios. If the ratio involves two quantities with the same dimension, the ratio will “cancel out” the dimensions, leaving a dimensionless quantity. This is useful because it means one doesn’t have to worry about the units involved in the problem. No matter what units you use to measure my weight and your weight, the ratio of our weights will be the same no matter what instrument we use. The next time you hear someone saying that a quantity is large, make sure to remind yourself what they are comparing their quantity too. Without doing this, there’s a chance for misunderstanding or manipulation. Therefore, don’t jump to conclusions when numbers are thrown around with the implication that they are large or small. Demand another number to compare it to! Why is the area of a circle given by πr2? I’m not asking why it’s in this specific form. Rather, I want to know why this is true. Can you tell me? Can you convince me? Let’s take something a bit more concrete. I bet you use a lamp every day to light up something in your home. Can you explain how the lamp works? What makes the bulb shine? How does the electricity work to create this light? These are all questions that have answers. You know they have answers. I’m not asking technical questions here. Just a simple explanation for how the lamp works would please me. You don’t have to start talking about the various particles that make up the lamp, or how light behaves as a wave and interacts with the environment such that we are able to see. I’m not surprised. To be honest, I can’t even give answers to some of these simple questions. You might think that we should be able to answer these types of questions. After all, we do use these things every single day. We should know how they work, right? And yet, most of us don’t know the inner workings of these machines and processes. We just know that they work, and that’s enough for us. There’s a technical term for this in science (computer science in particular): a black box. This expression refers to a process or a device which we can give an input and get an output, but the inside of the black box remains unknown. The only feedback we get is the output. This is not something we want in science. We would much rather have a process in which we knew each step along the way and how it went from step to step. However, in the absence of anything else, a black box that gives results is still useful. We aren’t going to throw away something that works just because we don’t know much about it! Black boxes signal that we have more to learn about (starting with the inside of the black box). We all carry around our own black boxes. These are processes that we know happen around us, yet we don’t have a clue what the inner workings are like. From our cars to our refrigerators to the internet, most of us don’t actually have any idea how these things work. We might be able to jumble along together an ad-hoc explanation, but these tend to be wrong and not thought out at all. When reflecting on this though, we often don’t care that we carry around these black boxes. It’s unreasonable to expect us to be knowledgeable about everything we use, so who cares if we don’t know how our car works? We know how to drive it, and that’s all that matters. To a certain degree, that’s true. Often, we are able to get by with only the knowledge of how to use our black box. We don’t need to know how it works. As long as we steer the car and follow the signs on the road, we trust that the car will do its thing and not malfunction. The issue is more about our perception of these black boxes. How many black boxes do you think you have? Chances are, the number you gave is too small. Way too small. The simple truth is that we use black boxes throughout all of our lives, often without realizing it. This is of particular interest when we consider education. So we are in agreement that people do use black boxes in their lives. As such, it shouldn’t be a surprise that students use black boxes in their education. These are of particular use in subjects such as science and mathematics, where one can get many answers without knowing the underlying concepts. What seems like learning is just a focus on the outputs. The danger with black boxes in education is that they are seductive. They represent a way to gather a lot of “surface-level” knowledge without digging deep to think about the concepts themselves. This means that if a student is having difficulty, it’s much easier to learn how to use a black box than to go through the longer process of absorbing the content. I see this quite often in my field of physics. Physics uses a lot of mathematics, but it’s not as concerned about the mathematical concepts. This means that a lot of the tools of mathematics are transported to physics, and can be used without knowing the theory beneath. Physicists encounter a lot of differential equations. However, professors teaching physics don’t often care about how one solves the equations. Instead, there are the staple differential equations, such as the simple harmonic oscillator, which every physics student knows and memorizes before they are done their education. Can they all explain the process of finding this solution (apart from telling someone to “plug it in and see”)? Probably not. Why does this happen? Why do we go from deep, underlying knowledge to trading it in for a black box that produces the right answer each time? The reason, I suspect, is because it’s much easier to remember the power rule than working it out from first principles each time. In fact, no one does that, because it’s a waste of time. Once we know the rules of the game, there’s no need to go back and rederive everything. The issue occurs when we go for so long without looking at the first principles argument and only remember the rules themselves. This is what we want to avoid. It’s at this point that our knowledge goes from deep understanding to being a black box. We then cease to be knowledgeable about the subject. Instead, we become proficient at using the tools from the subject. There’s a difference here, and it’s one that isn’t highlighted enough in school. Knowing how to use the tools of a subject to solve problems is a skill, but it’s not the same as understanding how those tools were developed. This is critical, because it informs how we make decisions about what to teach students. Do we want to focus on giving them skills to solve problems, or do we want to emphasize the concepts beneath? I don’t think we should focus only on one, but we are deluding ourselves if we think that schools (particularly early on) are emphasizing the importance of deep understanding. From my perspective, the priority is skill first, deeper understanding second. This aligns precisely with the use of a black box. Students aren’t incentivized to dig deeper and develop more of an understanding of their subject. They’re incentivized to solve problems quickly and know how to do a lot of things. The byproduct of this is that black boxes are used to keep up. Again, I’m not saying that the black boxes aren’t useful. They are, but if we want to do more than pay lip-service to the idea that students should have a deep understanding of their subject, we need to highlight this tendency to default to black boxes. On the other hand, if our priority is to only develop the skills of students, then fine, we can keep on using black boxes. We just can’t have it both ways. What are your black boxes? I hope I’ve convinced you that black boxes are everywhere. Now, I want you to think of your own life. What are your black boxes? We all have them, and my objective here is to get you to think about what they are. At some point, we all hit a black box where we just don’t know how something works. This isn’t a bad thing. In fact, it’s a good exercise to see how deep you can go. Chances are, you won’t go far with most things. You will only be able to go deeper with the subjects you are passionate about. That’s okay and normal. Now, think about your black boxes. Can you push past them and get a better understanding of the underlying mechanics? Pick a few that you want to get past, and start learning about them. Read a book on the subject, or ask a friend who is knowledgeable. I warn you that this is difficult, painful work. Understanding something isn’t a trivial task, so make sure you really want to learn. You will know that you aren’t using a black box anymore when you can explain the idea or concept to someone who has no idea how it works. This is what you should strive for. If you can explain the concept (and not just recite it from a book), there’s a good chance you aren’t using a black box anymore. This is my goal for education, both for myself and for the students I work with. My motto is “mathematics and science without black boxes”. More than anything, I want to help students understand what they are learning, not just how to use the tools to solve problems. The pendulum in education has swung too far in the direction of building skills without knowing the underlying concepts. My aim is to help nudge it back in the other direction. There’s nothing wrong with building problem-solving skills. But we miss out on a large portion of the value of education when we only look to develop our skills. If you ask mathematicians, they will tell you some variant of “mathematics is art”. Many won’t tell you that they do mathematics to only solve problems in the world. Instead, it will be about gaining a deeper understanding. In essence, they are trying to push through their own black boxes. Why? Because they value knowledge in addition to solving problems. Mathematics and science doesn’t have to only be about being skilled with tools. It’s an opportunity to inspect one’s black boxes, and work at opening each one up to peer inside. Here’s a question. What’s the best outcome that can happen when you take a course? The most common answer (and one I would give myself) is to get 100%. To do everything perfectly, never making a mistake. Most students agree that this would be the ultimate goal. How could anything be better than getting a perfect grade? When you look back on a course, what do you think about? Chances are, the final grade you got is a good indicator of how you thought about the course. It’s the only tangible metric left, so we base our reflections on that one number. The number is supposed to encapsulate our knowledge anyway, so where’s the harm in using the grade as a proxy for how we felt about the course? The problem is that you never even mentioned that you took a course in order to learn. It’s worth thinking about this, because we go through tons and tons of classes in school worrying only about our grades. At the end of the day, who cares if you think you learned a lot in a course? If your final grade doesn’t reflect this, no one else will try and dig deeper to say, “Yes, you might not have finished with a good grade, but you’ve learned so much and grown throughout the course.” As such, the incentive is to turn away from learning, and focus on getting good grades. Good grades unlock new opportunities. Saying you learned a lot in a course but only getting an average grade doesn’t convince anyone. Therefore, it’s natural that we learn to focus on getting good grades instead of learning in general. If learning happens during a course, that’s great, but it isn’t something to focus on. Think about how you feel once you’ve written the final exam for your course. Do you think, “How can I fit these new concepts and principles into the way I think?” I’d predict your thoughts go along the lines of, “I’m finally done with this course! I just hope I did enough to get a good grade.” These two attitudes illustrate the difference between going to school to learn and going to school to get good grades. It may be surprising, but you can get good grades in school without learning. It’s possible. You don’t even have to turn into a memorization machine. You just have to know what to focus on at the right time, and be a good performer on tests. In a sense, we do learn something in school. We learn that society rewards those with good grades, which means we have a choice. We can either focus only on getting good grades to impress others, or we can dig deeper to do the difficult work of learning. That means being able to explain topics to others. It means being able to think through a problem without just wondering what special fact or result is needed to resolve it. Learning is a different kind of skill, and it’s one that is too often in short supply at school. I’m not sitting on my high-horse here. I feel the pressure to get good grades just as much as you, the reader. When I’m overwhelmed by the amount of work to be done, I retreat to my defaults: get good grades, don’t worry about learning itself. I know this is the wrong mentality, but I also know that a lot of my academic future relies on getting good grades. My advice is simply this. As much as we spend time focusing on getting good grades, you need to take time to think about if you’re also learning. This is more difficult than it seems when you’re getting good grades. That’s because you will be able to answer many different problems that involve the concepts you looked at in class. However, like I wrote above, a key indicator of learning material is being able to explain it on your own. If you don’t have your notes, can you give an impromptu explanation to a friend? How about someone who knows nothing about the subject? If you can create an explanation to that sort of person, then you’re doing alright in terms of learning. I think many people will be surprised to find that they can’t do this. If that’s you, don’t worry! It’s an indication that you have more to learn. Take it as an opportunity to go back and try to soak in the information from your class, but also remember to explain it to others. The priority of our education system isn’t aligned with learning. It’s aligned with getting good grades so that you can stand out. Therefore, if you want to be more than just the student who can get 100% in your class, then it’s up to you to focus on the more intangible aspects of learning. No one will look out for you, or care that you’re doing “more” work. However, the difference will show up in the long run, because you will understand the topics deeply versus those who only prepared enough to ace the final exam.